Eva's Cottage01263 715779work01603 870304fax Self-cateringThis quaint three hundred year old end-of-terrace carrstone cottage is perfect for groups and families. Tucked away from the road, this property boasts mature gardens for guests to relax in and is less than two miles from the nearest beach. Situated close to the Royal Sandringham Estate and within easy reach of RSPB reserves at Snettisham and Titchwell, there is plenty for guests to do and see in the local area. • Other: Linen, Books, Telephone for incoming calls and Games provided. Towels available for hire. Neigbours have right of way along side and rear of property. 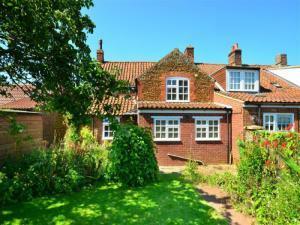 This quaint three hundred year old end-of-terrace carrstone cottage is perfect for groups and families. Tucked away from the road, this property boasts mature gardens for guests to relax in and is less than two miles from the nearest beach. Situated close to the Royal Sandringham Estate and within easy reach of RSPB reserves at Snettisham and Titchwell, there is plenty for guests to do and see in the local area.